Hello Crafty friends, It’s Saturday and that means it’s time for a brand new challenge over at Just Us Girls. 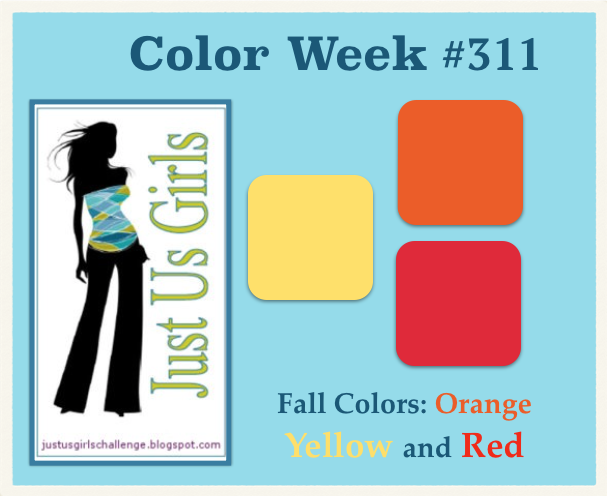 This week it’s color week and Maria our hostess has picked out some fall colors for us to enjoy working with. I didn’t embrace the colors and go in the direction of a ” Fall ” card as one might think, as I was in the need of a fun card to send to one of my crafty friends. This card was quick and so fun to thrown together. Hope she likes it! The stamp sets are from Paper Smooches and are called Positive Strokes and I Heart Art. I paper pieced the paintbrush and added some faux stitching to tie in the black as it looked a little lost. Categories: Cards | Tags: Card making, Cards, Paper Smooches, rubber stamps, stamping, Thinking of you | Permalink. What a cute card Nancy. I love your design and the use of the challenge colors. Love it! 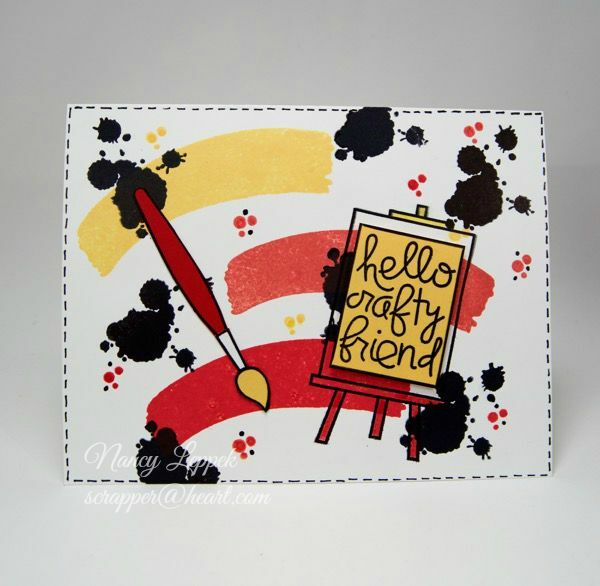 What a fabulous “crafty friend” card!!! Bold and beautiful. What artist wouldnt adore this? That is so cute and sure to be a hit with all those crafty friends of yours too! I love your artsy design! The brush strokes and splatters and perfect with the easel. Way to rock our color challenge! Oh so super cool! Love it!! Nicely done!! Glad to see that you went in a different direction with this card. It is so original and artsy! Perfect for a crafter. Love it. What fun, Nancy. I love the colors and splatters. Great for a crafty friend. Super cute card! Love it! This is so cute and creative! Love all of the swipes and splatters….very cool!